One of my favourite restaurants is also one I rarely go to. And that’s because it’s harder to get a table there than any other in town. Not that it’s super-chic or anything. In fact, quite the opposite, Buko Nero is a small, humble 20-seater run (and staffed) by Oskar and Tracey, a lovely husband and wife team. Regulars book out most nights, and if you want to try this Italian-fusion “hole in the wall” (which is what “buko nero” refers to), be prepared to call 1 month in advance. This weekend, my wife and I took my parents. My father has been been asking us to bring him there for, well, the last couple of years. But like I said, you have to plan a month in advance. Among the tasty dishes we had, both my parents and I ordered the Tau Kwa Tower, a signature dish, and one of the few “fusion” dishes on the menu. 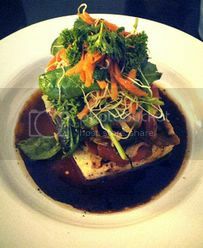 It’s a delicious plate of pan fried bean curd topped with veggies and sauced with kecap manis. My parents split, as a second course, a crabmeat and prawn pasta dish, with a very light spicy-tomato sauce. For a third course, they both had oven-baked cod. My father is digging into his here. 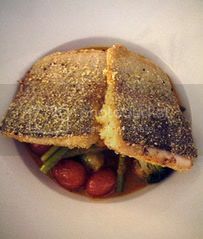 I had a polenta-crusted trout served with cherry tomatoes and a variety of other greens. 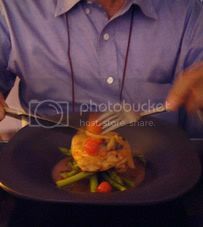 The sauce was a delicious reduction of a seafood bisque with cherry tomatoes. To finish off, I had two tiny slices of what Oskar calls “My Grandmother’s Cake”, a delicious, light, flourless, white chocolate cake, and a double chocolate cake. I much preferred Grandma’s cake. Over dessert, we also discovered that this May marks the fifth anniversary of this super-popular little restaurant. Congratulations are in order to both Oskar and Tracey!